Omarosa Releases Tape Of Lara Trump Offering Her $180K Job In Return For Not Trashing Glorious Leader - Joe.My.God. The tape — which, according to Manigault Newman was made on December 16, 2017, just days after she left her White House job — appears to corroborate claims she made in her new book about receiving an offer from the president’s re-election campaign. Manigault Newman wrote in her book that the job offer came with the condition of signing a non-disclosure agreement; she said she did not accept it. 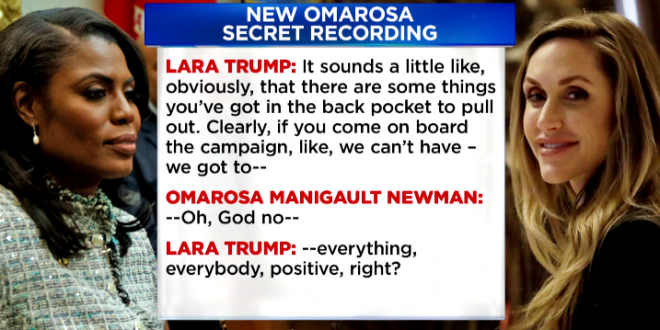 On the new tape, Lara Trump says, “It sounds a little like, obviously, that there are some things you’ve got in the back pocket to pull out. Clearly, if you come on board the campaign, like, we can’t have, we got to,” she continues, before Manigault Newman interjects, “Oh, God no.” “Everything, everybody, positive, right?” Lara Trump continues. 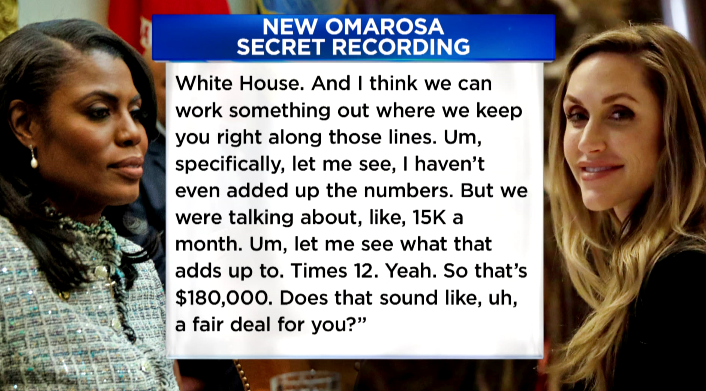 LISTEN: Omarosa’s secret recording of a call she had with Lara Trump in which they discuss Omarosa’s potential salary if she came to work for the Trump campaign.